No. The universe has to move forward. Pain and loss, they define us as much as happiness or love. Whether it's a world, or a relationship... Everything has its time. And everything ends. - Sarah Jane Smith, "School Reunion." 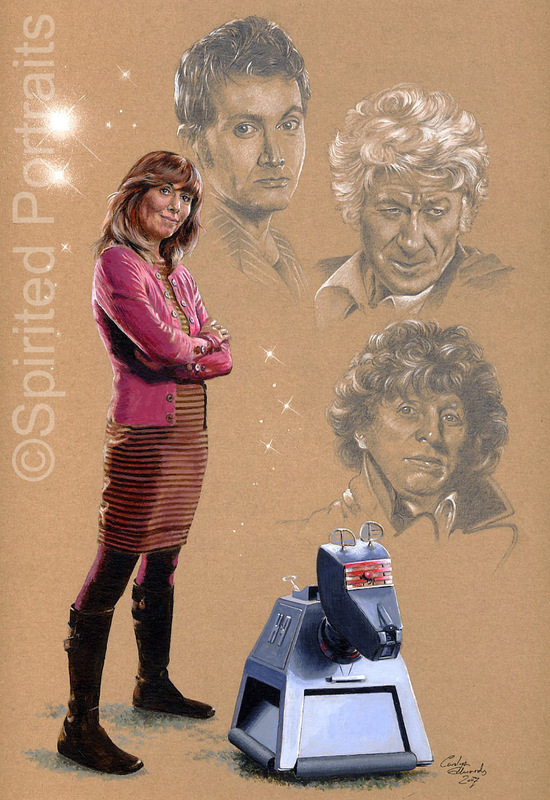 Actress Elisabeth Sladen passed away today at the too young age of 63. I knew her best as Sarah Jane Smith. I know it's just a character that she played, but it feels like so much more than that. It's a character she brought to life and entirely embodied. She's beloved by so many fans for a reason. Sarah Jane grabbed my heart the first time I met her in "School Reunion." Sladen just has that sort of presence. It's not demanding, but it makes you take notice. She was brilliant and inspiring. I've only seen her in the new Doctor Who, and I've wanted to go back to the Fourth Doctor at least because of Sarah Jane. I need to do that as soon as possible. Rest in peace. You will be missed. i remember her as a young lady, playing Sarah-Jane, and only know her as that character. Sarah-Jane was the first attempt they had at a 'feminist' character, and while she started as a stereotype, and then eventually devolved into the traditional screaming victim to be rescued*, she had a great warmth and sense of humour and independence. I did resent the later re-write which had her waiting miserably for the Doctor to return for her. If she'd loved the Doctor, she would have said so, i firmly believe. As for Elisabeth Sladen, I have only ever heard good things about her, including her extensive work within the extended Dr Who universe. As long as I live, i won't forget her. *admittedly conditioning certain parts of my personality in the process! I'm looking forward to going back and seeing her in earlier Who. So I'm late getting to this, but just saw it linked from the main page. She was amazing, and if you want extended newer stuff definitely check out the stand alone series "the Sarah Jane Adventures" It's a bit on the cheesier side, and I think targeted a younger audience, but it's still a really fun show that, while lacking the Doctor, still gives you a different glimpse into that world. 1. Founding The Church – The Foundation of this holy site La Sagrada Familia set up around the 19th (1866-1833) century by a Spaniard named Josep Bocabella. The Spiritual Association of Devotees of Saint Joseph constructed this church and dedicated it to the Holy Family. 2. Construction of La Sagrada Familia under Gaudi – After the foundation of this church, Gaudi takes a charge of this project on 1883. He transformed this site into a new architectural style with his own forms of Art Nouveau. In 1892 the foundations for the Nativity facade were started along with construction of Portal del Rosario. In 1923 he produced the final design for the naves and roofs and made first 100 metres high bell tower Nativity facade on 30 November 1925.